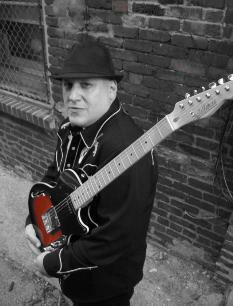 High energy traditional and original blues -- hot chicken pickin’ blues guitar with soulful vocals. Selected as one of the top 8 "MySpace D.I.Y. Guitarists" by Guitar Player Magazine. John D’Amato’s love of The Blues was forged from an early childhood of seemingly endless doctor visits, medical tests, lonely hospital stays and painful medical procedures which didn’t end until a new surgical procedure was developed that saved John’s young life. This experience had a profound effect on John, teaching him the lessons of fear, pain and loneliness, but also faith, hope and the healing power of music. John turned those lessons into a life of playing guitar and soulful singing, starting at the age of ten. John was accepted into an experimental performing arts high school at age 15 and quickly became one of the most in-demand guitarists around his hometown of New Haven, Connecticut. His regional country band, Kim Clark & High Sierra often shared the bill with many national touring country artists including Tammy Wynette, Waylon Jennings and Asleep at the Wheel. In 2001 John relocated to Nashville to pursue his production, songwriting and performing goals. John combines incendiary yet tasteful guitar solos with a unique soulful vocal style, taking his songs to another level, wildly appreciated by fans and music industry insiders alike, yet skillfully keeping the traditional blues sound. His reputation as a guitarist has led to performances with B.B. King, Billy Cox (Jimi Hendrix’s bassist), Shrapnel recording artist Eric Gales, Lofton Creek recording artist Will Peppers, and blues legend Joe Louis Walker. John is one of the new generation of blues men: a guitarist that has the technique of Chet Atkins, the intensity of Stevie Ray Vaughn and Johnny Winter and the phrasing of B. B. King and Dickie Betts. Combine that with a soulfully unique vocal style and you have an accurate description of John D'Amato's music.